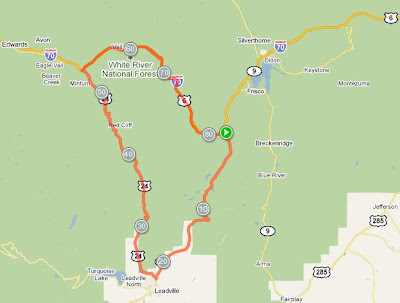 For any cyclist coming to this area with a road bike, there is a fantastic 82-mile loop ride in this area called the Copper Triangle. You will need to combine road and bike path riding to complete the loop, but it is worth it. This is one of my favorite bicycle rides in all of Colorado! The scenery and challenge is just perfect. Another good bike ride in the area is from Frisco or the (ski) village of Keystone up Loveland Pass and back Recommended Ride: Loveland Pass . Or another is from Frisco to Vail and back (on the bike path) Photo of the Day: Riding Vail Pass . 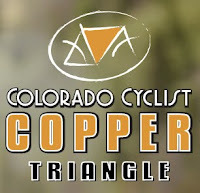 3000 riders converge on Copper Mountain every year in Colorado for the annual Copper Triangle Event Ride. Every state in the USA is represented as well as participants from Asia and Europe. The course is a 78 mile loop route over 3 mountain passes, Fremont Pass (elevation 11,318’), Tennessee Pass (elevation 10,424’) and Vail Pass (elevation 10,666’). The total elevation gain for the course is 5,981 ft. This is a great route to ride, made much easier by having aid stations, and much nicer by having a celebration village and lunch at the end of the ride. There will also be a concert, happy hour, and showing of the old movie American Flyer the night before the event at the ski Village of Copper Mountain. The event has traditionally been a fundraiser for the Davis Phinney Foundation. Davis Phinney usually rides and will be on hand to show support. Word began to spread in the spring that registration for the ride was selling out quickly for 2010. After the other popular Colorado ride, the Triple Bypass sold out in less than 45 minutes in January. 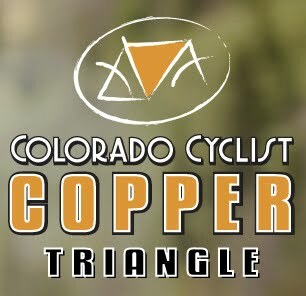 The Copper Triangle is completely sold out, it is a very popular ride here in Colorado, combining a great loop route, good weather in August, nice volunteers & organization, and a festive atmosphere after the race. I'll be riding the with my good friend Christy this weekend. I can't wait.